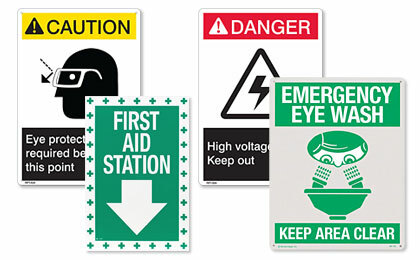 These easy to identify safety and hazard warning signs help keep workers and visitors safe at your facility or jobsite. Our safety signs are designed to provide immediate notification and warning with clear, bright graphics and information. Our selection of safety signage includes: warning signs, danger signs, caution signs, exit signs, first aid and eyewash station signs, plus hazardous area signage. Rigid Plastic Signs are silk screened using UV inks for long lasting durability. Adhesive Vinyl Label Signs are silk screened using UV inks and laminated for durability and fade resistance. All of our signs meet ANSI Z535 Safety and Alerting Standards. Keep your workplace compliant with OSHA and promote safety and accident prevention. Emergency Eye Wash Station 3D Rigid Plastic Sign 18" x 10"
3D Stand-Out AED Sign - Rigid Plastic - Automated External Defibrillator Location - 5" x 6"
Danger High Voltage Rigid Plastic Sign - 7" x 10"
Danger No Smoking Rigid Plastic Sign - 7" x 10"
Caution Eye Protection Required Rigid Plastic Sign - 7" x 10"
Danger Flammable Materials Rigid Plastic Sign - 7" x 10"
Danger Authorized Personnel Only Rigid Plastic Sign - 7" x 10"
Danger Construction Area Rigid Plastic Sign - 7" x 10"
Danger Flammable Rigid Plastic Sign - 7" x 10"
Caution Hard Hat Required Rigid Plastic Sign - 7" x 10"
Danger Keep Out Rigid Plastic Sign - 7" x 10"
Caution Hearing Protection Required Rigid Plastic Sign - 7" x 10"
Glow-in-the-Dark Exit Sign - Adhesive - 12" x 8"
Glow-in-the-Dark Directional Arrow Sign - Adhesive - 8" x 5"
Glow-in-the-Dark "No Exit" Label - 5" x 5.25"
Smoking Permitted Sign - Silk Screened on Rigid Plastic - 8" x 10"